Wolverine Radio was yet another pirate station I recorded last Saturday night (along with Radio Ronin and Radio Appalachia). Wolverine Radio was broadcasting on 6.95 MHz in the upper side band. Their signal was very good and fidelity excellent for SSB. Lots of variety and a common "radio" theme throughout WR's music mix. 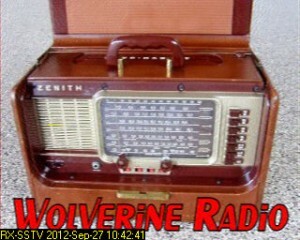 Wolverine Radio--at least each time I've heard them--sends an SSTV image at the end of the broadcast. I decoded the one in their Satuday night broadcast (see image on right) using RX-SSTV, a very intuitive and simple freeware PC application. Make sure you use the "Scottie 1" mode.